Wonderland is a wooden bowl found in the heart of Christiania, an autonomous community in Copenhagen, Denmark which has the unique status that it is only regulated by “special law”. This transfers part of the supervision of the area to the state, which, among other things, allows them to sell (soft) drugs there, such as hash and marijuana (not drugs like cocaine, heroin, or speed). Christiania could be compared to Amsterdam in many ways, and has much of the same mystic and excitement shared by stoners from all over the world that are sick of their own countries regulations about using weed and the penalties for disobeying these laws. But one of the many things that makes Christiania different from Amsterdam, or any other place in the world for that matter, is that Christiania also has an indoor wooden bowl known as Wonderland. 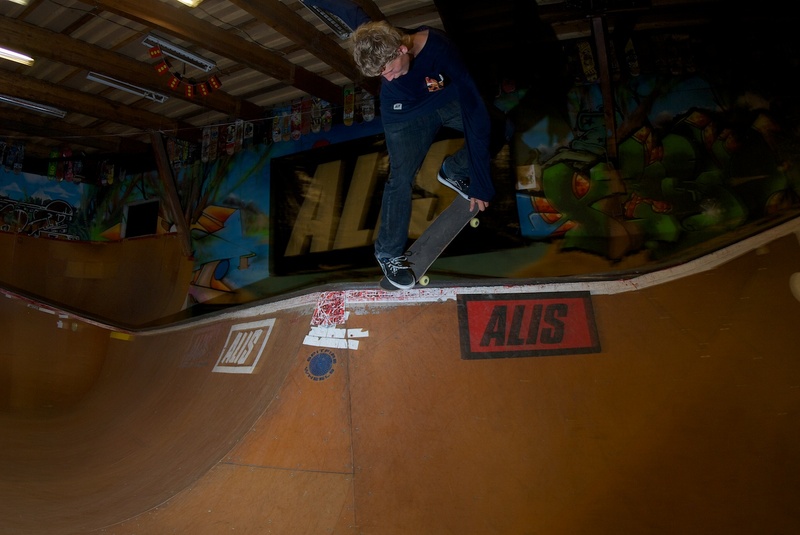 This wooden bowl was created through the efforts and funding of Alis, with the construction by skaters from all over—including guys like Tom Penny and Justin Ashby. Wonderland isn’t run by pad nanny pigs or security guards and doesn’t have an entrance fee or opening and closing hours, but that doesn’t mean any random kook can show up there and skate. You better bring something to donate to the spot (like a skate deck or your own skateboard), and not just come there to take from the community, but also to give – if nothing else, at least your respect. And watch out for the locals! And I don’t just mean the skaters…. After a few days in Malmö, Sweden for the Ultrabowl, we, along with about 25 other skaters, stopped first in Copenhagen on the way to other skate destinations around Europe. It was this one night in Wonderland where skater crews including Lifeblood, Bacon, Vagrant, Alis and Independent from countries including Denmark, USA, England, Scotland, and France all converged in Christiania (after a full day session at the Faelledparken) without any sort of organized plan, and had a session with some Wonderland locals…. Skaters include: Danish locals Dannie Carlson and Narlieman, Julien Benoliel, Jake Collins, Sox, Mason Merlino, Frank Faria, Brian Genrich, Zack Dowdy and Tom Lawson. Lurkers… too many to name. One night in Wonderland – an unforgettable experience, no matter what they say about short term, or was it long term memory?